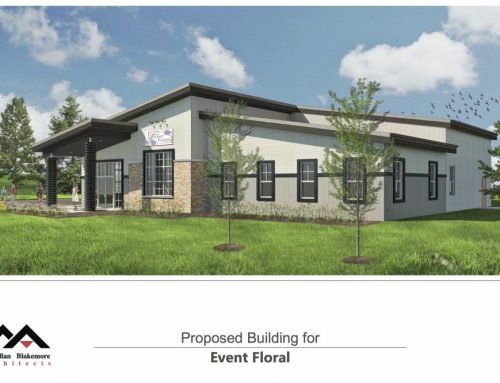 For the 64th Annual OSF Pink Ball, Event Floral partnered with event chairs Brent and Lauren Johnson (Ringland-Johnson Construction), OSF Saint Anthony Foundation officer Ryan Duvall, Giovanni’s, and SVL Productions to produce this premiere social event in Rockford. 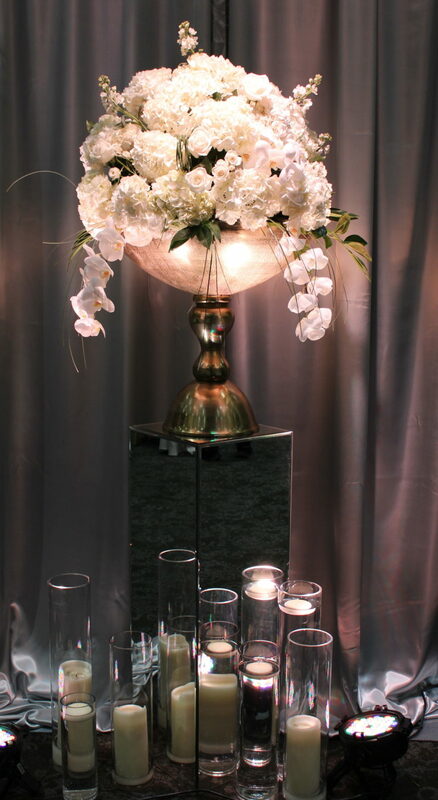 With the refined, creative vision of Lauren Johnson, Event Floral worked to execute floral, linen and décor. In keeping with the formal nature of this event and continuing to create never-before seen elements each year, we dreamt of a modern and sleek design, monochromatic floral centerpieces and linens, mixed metallic finishes, and a statement flower wall that would serve as the backdrop to the evening. 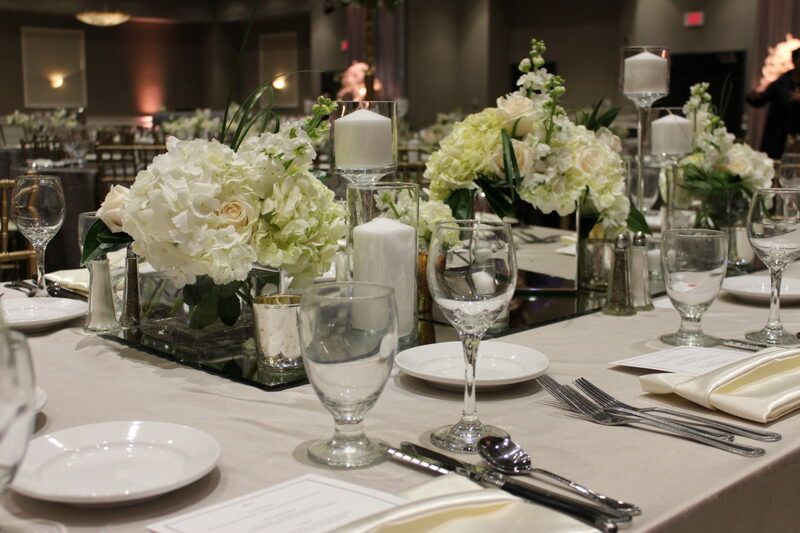 Silver table linens were topped with mirrored glass, abundant candle light, and collections of coordinating flowers. 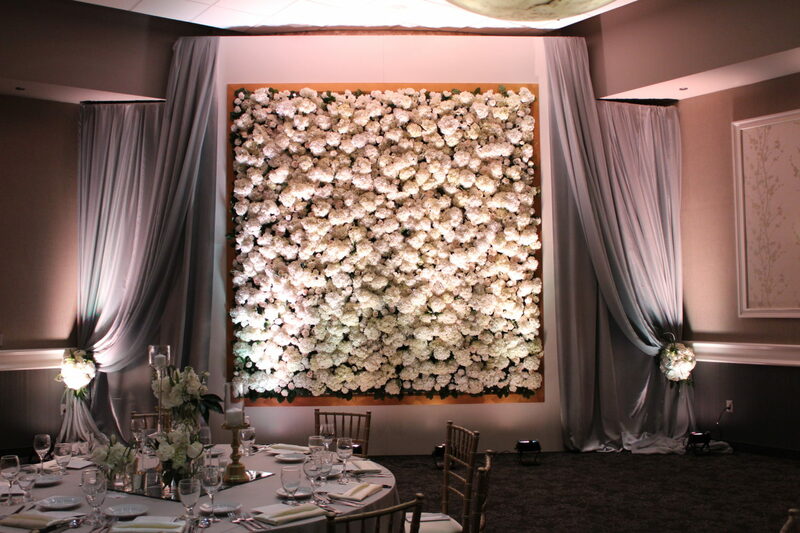 The metallic stage backdrop provided by SVL Productions, along with large, statement arrangements placed strategically around the ballroom both complimented the expansive, custom built flower wall created just for this event. 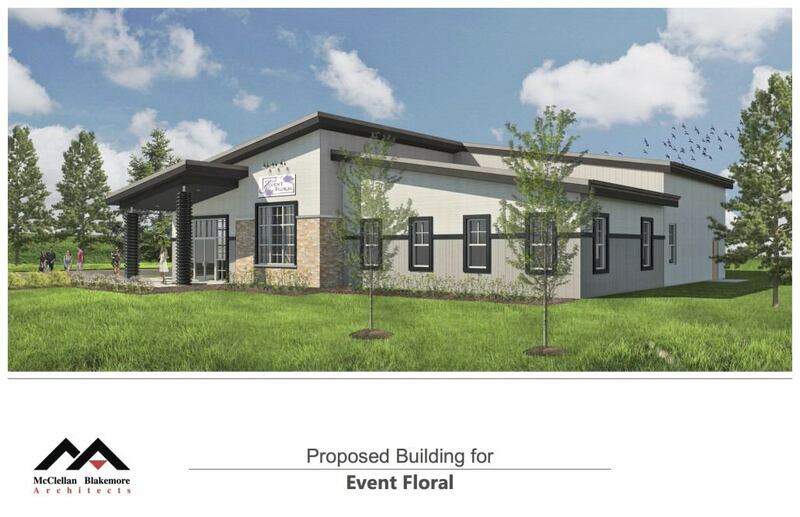 This 14-foot-tall structure was built by Ringland-Johnson Construction and featured 600 hydrangeas, 300 roses and countless carnations, tulips and accent flowers. Not only was it a true statement piece in the room, it served as the perfect backdrop for event guests to be photographed as they entered the black-tie affair. See the image gallery below for a detailed look at the elements that made up this event. Tables were lined with various mirrored vessels, white flowers and glass elements to create a simple, yet abundant tablescape. 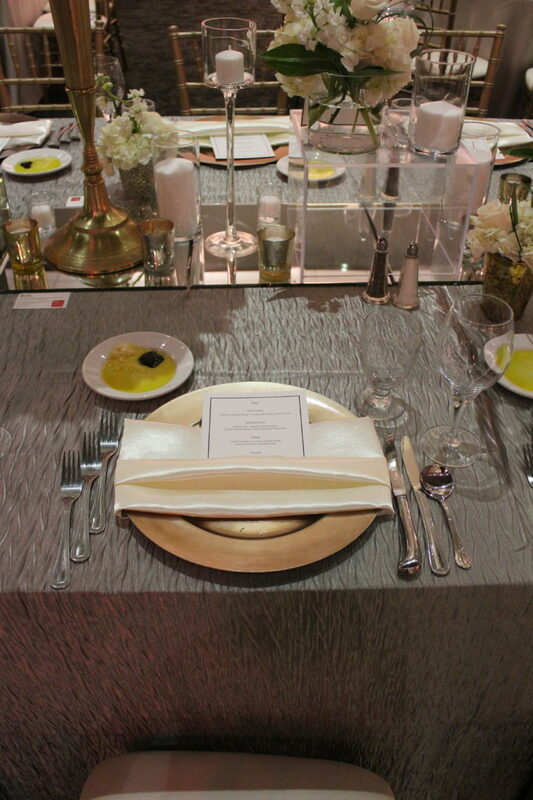 Premium linens in shades of silver complimented the mixed metallic elements on the table. Large statement pieces were placed throughout the room, creating stunning focal points. The custom built, fresh flower wall with over 1,000 blooms and subtle glistens of mirror tiles was the perfect backdrop as guests entered the room. 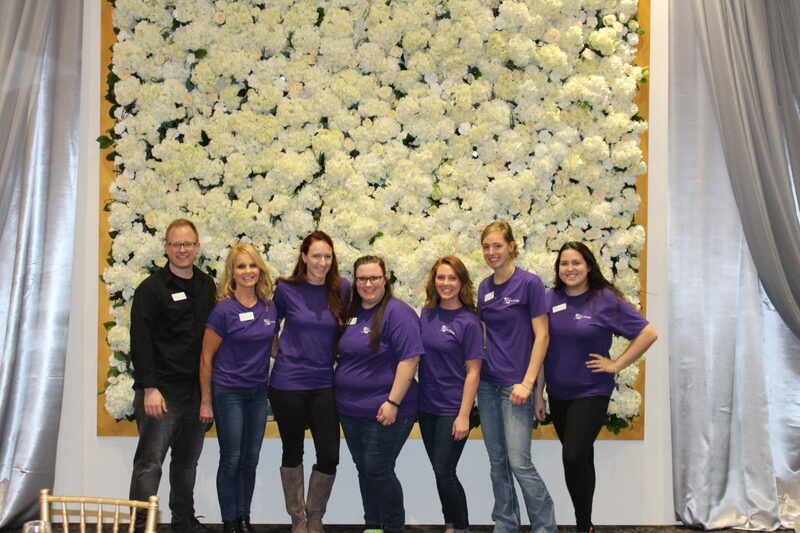 The Event Floral Team who worked to execute this beautiful event: (left to right) Manager Jordan Calgaro, Designer Kim Dazey, Owner Erin Stoffregen, Charlotte Schlossmann, Grace DeSchepper, Annie Von Arx, Alyssa Russo. Not pictured: Head Designer Diane Didier-Adolphson, Michelle Demrow, Sherry Farmer, Pat Filak, Karen Larson, and Korissa Steger.